Challenging the historical record that Nazi leader Adolf Hitler shot himself in his Berlin bunker, on April 30, 1945, a Brazilian Jew has claimed in her first book that Hitler lived as “Adolf Leipzig,” known locally as the “Old German,” in the small town of Nossa Senhora do Livramento, 30 miles from the Brazilian city of Cuiaba, and died at 95 years old, in 1984. The book, entitled ‘Hitler in Brazil – His Life and His Death,’ written by Jewish journalism student Simoni Renee Guerreiro Dias, forms part of her thesis that is still being written. Guerreiro Dias claims that Hitler fled Germany to Argentina, then to Paraguay before settling in the Brazilian state of Mato Grosso to hunt for buried treasure with a map given to him by Vatican allies, according to the Irish Mirror on Friday. 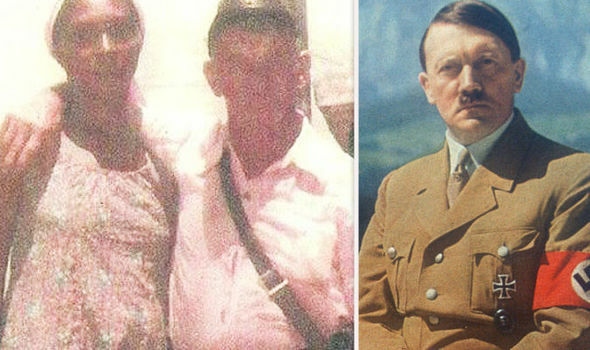 The Irish Mirror said the author published a photo of “Adolf Leipzig,” two years before his death with a black girlfriend named Cutinga, and argued his relationship with a non-Aryan was part of a ruse to conceal his identity. The photo, available on the internet, conceals the features of the man’s face. The Irish Mirror cited Brazilian newspapers as reporting that the author is now planning a DNA test based on a sample from a relative of Hitler living in Israel. She has also secured permission to exhume the man’s remains in Nossa Senhora do Livramento. The newspaper said that, according to the author, an unidentified Polish nun recognized Hitler in a hospital in Cuiaba in the early 1980s and demanded that he leave, but was reprimanded by a superior who claimed he was there on Vatican orders. In the new book, the author links Hitler’s arrival in Brazil to a Vatican offer of ownership rights over buried Jesuit treasure in a cave near his adopted home, and adds that the name “Leipzig” was inspired by the birthplace of Hitler’s favorite composer, Bach. Conspiracy theorists have long argued that Hitler followed Nazis Adolf Eichmann and Josef Mengele to South America, and another book, 2011’s ‘Grey Wolf: The Escape of Adolf Hitler,” claimed Hitler and his mistress Eva Braun fled to Argentina’s Patagonia and had two daughters before dying in 1962, aged 73. The recent conspiracy theories were boosted in 2009 by DNA tests on skull fragments found near the bunker where Hitler is believed to have died, that belong to a woman. Rochus Misch, Hitler’s bodyguard, who is believed to have been the last person to see him alive, died last September, aged 96. Misch lived with Hitler and Braun in the underground bunker, and said he saw Hitler slumped, with his head on the table after hearing a gunshot behind his closed door.